Over the years, there have been some very bad superhero movies that Hollywood has managed to churn out. In the modern age, no superhero movie has been quite as universally panned as Fox's Fantastic Four reboot from last year. 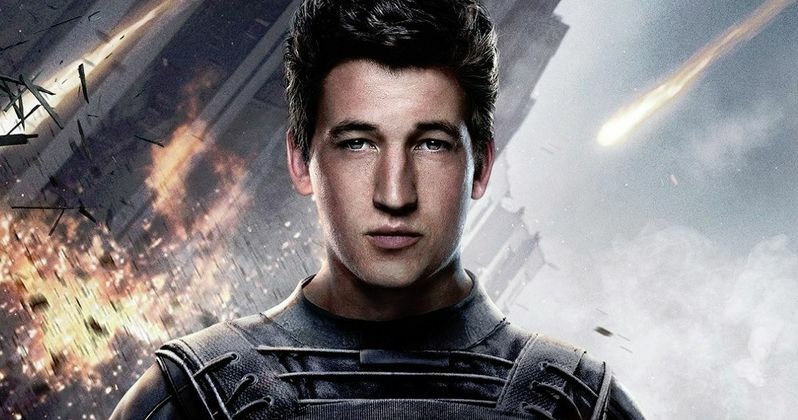 Despite the complete lack of any sort of praise and anemic box office take, star Miles Teller is still very much open to the idea of doing The Fantastic Four 2. Miles Teller just started doing the initial rounds of press for his upcoming movie War Dogs, and he recently sat down for a chat with JoBlo. During the course of the interview, the subject of Fantastic Four inevitably came up, and Teller seemed oddly optimistic about the potential future of the franchise. Here is what he had to say. "I loved the cast, I loved the characters. I think it's such an interesting dynamic. I love how much they really need to rely on each other. This Avengers thing, they've kind of created their own Fantastic Four in a way, Marvel's first family. Their powers can't just exist on their own, you need Thor to do this, the Hulk to do his thing. So yeah, absolutely, I would do another one." Most people who saw Fantastic Four would find any positive comments toward the project to be confusing, but oddly enough, Teller makes some pretty compelling points. Fantastic Four was Marvel's first family, and the characters have endured for more than fifty years. So even though Hollywood can't get it right on screen, the characters are worth telling stories about. Not only that, but it is kind of hard to argue against the excellent cast. Teller, of course, was joined by Kate Mara, Jamie Bell and Michael B. Jordan. But Jordan may be the reason that a sequel to Fantastic Four will never happen. Michael B. Jordan is one of the most in-demand stars at the moment, despite the failure of Fantastic Four. In fact, he is already getting a shot at another superhero franchise. Marvel recently announced that Jordan will be playing Erik Killmonger in Black Panther. That movie is being done for Marvel Studios, and Fantastic Four is currently owned by Fox. At the moment, the two studios aren't really getting along very well, with Marvel pulling X-Men and Fantastic Four merchandise off shelves, and axing the characters in the comic books. The fact that Jordan has defected may cancel his chances for a return to Fantastic Four. Though the actors did sign multi-film contracts. Who knows where that all stands now. Teller isn't the only one who has echoed the idea that Fantastic Four in its current iteration isn't totally dead. Producer Simon Kindberg has also stated that a second movie could happen, but it seems like a doomed project. Currently, Josh Trank's Fantastic Four has an abysmal 9 percent approval rating from critics on Rotten Tomatoes, and some might call that generous. Not only that, but the $120 million dollar budgeted blockbuster only brought in $167 million worldwide, which in no way turned a profit for the studio after the massive marketing budget is factored in. In spite of that, Teller would be willing to bring his talents back to Fantastic Four, which is something. It likely won't get fans back on board, but it is something.